The Fourth Frog Blog: Got a reader on your holiday shopping list? So I just click on your link to give you another entry? I don't want a Kindle... but would love it if you won one! You know, I don't know if you just have to click or if you have to click and enter. Do whatever feels right, I guess. If you enter and win, you could always give it away on your blog or sell it. I did it! I entered and I now have a widget on my sidebar! 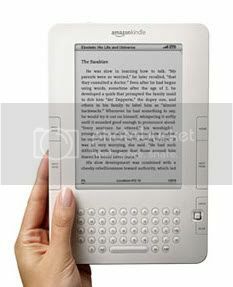 I'd LOVE a Kindle!!! I'd love a Kindle too. We got Joshua a Sony Reader for graduation. I'm going to borrow it for upcoming travel, lol. We are such a nerdy bunch!